Today we look at Van Gaal's "favored" system, the 3-5-2 or 3-4-1-2. Here's the 3-5-2 with wingbacks in Football Manager, again with auto-assigned roles and duties, my weird idea of scientific objectivity. Young and Valencia aren't natural at all as wingbacks in FM, so Shaw and Rafael are playing the spots they've been taking in real life. No matter who you play or don't, the bench is preposterous: Falcao, Rooney, or Van Persie will have to sit. Two of Januzaj, Di Maria, and Mata just about have to be benched. The computer chose Carrick and Fletcher over Herrera and Fellaini. Everyone says Van Gaal's 3-5-2 won't work at Man U, and this is why: You have to start extra mediocre defenders over world class offensive talent. 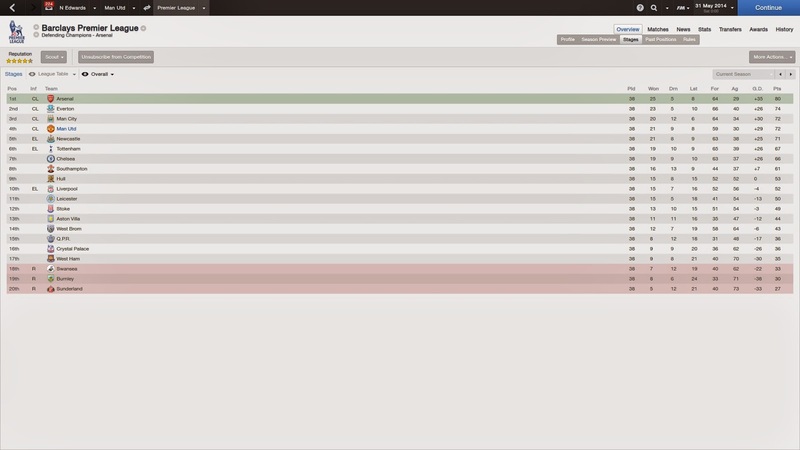 I finally managed to keep my job through a whole season, now that I've used an actual reasonable formation. And Manchester United would have to be thrilled with a 4th place finish in real life this year, even if it did result in barely playing some $100 million players. And here's the even more dramatic part: Man U had the title in hand for virtually the whole season, only losing it with a terrible last month and a half. You can see their terrible end of season here: Losses to West Brom, QPR, Arsenal, and Everton, with draws against Man City, Crystal Palace, and Southampton sandwiched in-between. 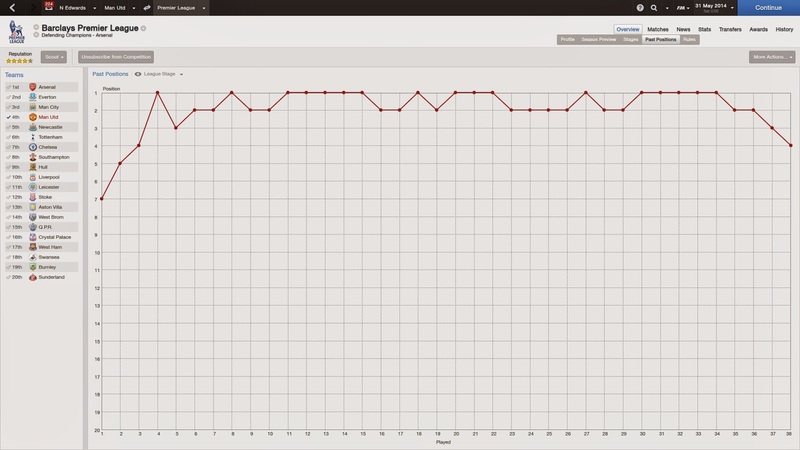 Anyone who played FM14 would know that the game thinks very highly on Man United even before all their recent spending, with any long-term game usually ending with David Moyes pulling off a Ferguson-like career with the team. 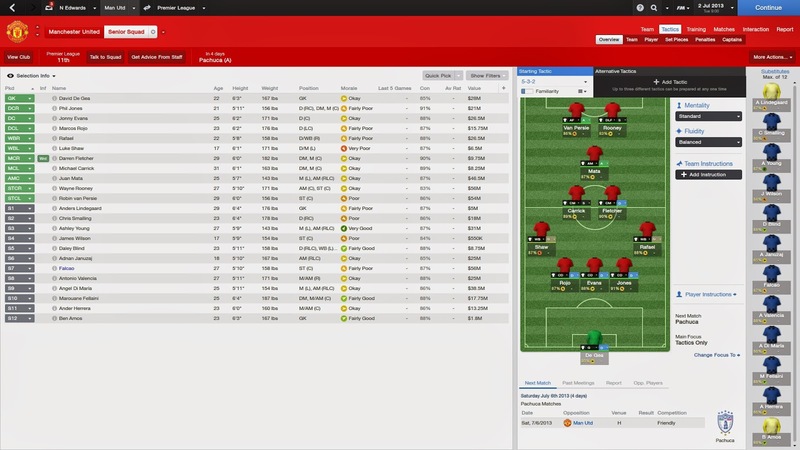 And this sim shows the new players and 3-5-2 formation are still plenty viable. 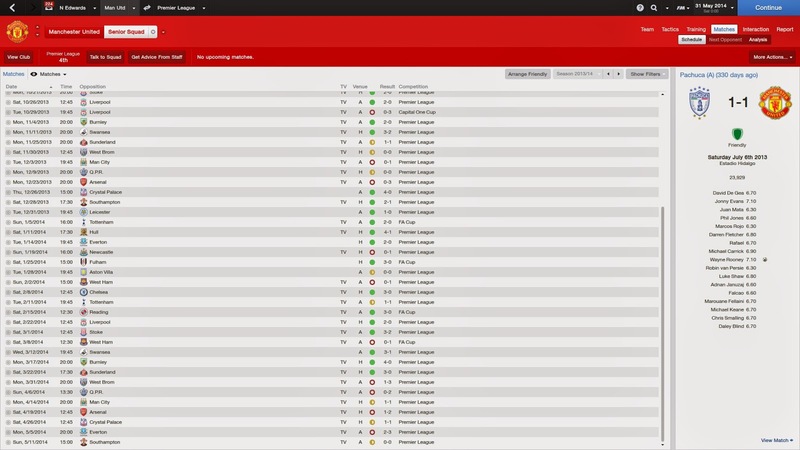 It will be interesting to see how they play with the new ratings in FM15. 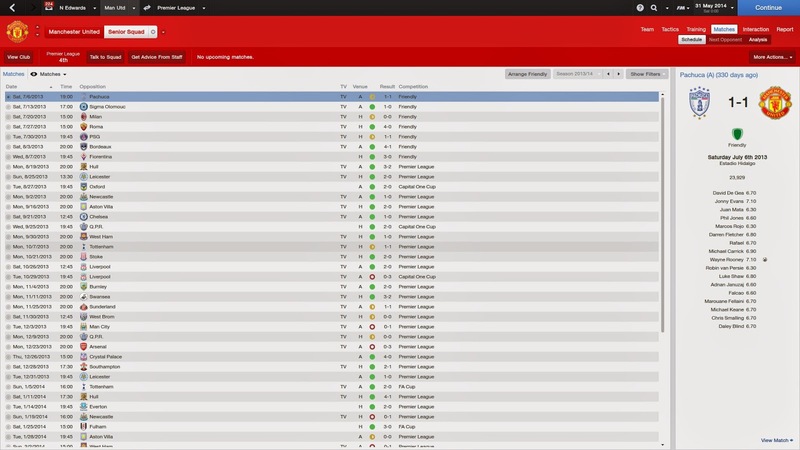 Poor Ryan Giggs, Assistant Manager, has been taking control of the team through all these sims for me. He's been forced to use whatever formation I give him, and that's not fair. So next time we're going to let him pick his own formation and team, and see how things go. Next up: Giggsy's 4-4-2.